On 10th of November 2017, the GST Council emerged out of its meeting at Guwahati, raining GST rate cuts on businesses. GST rates on about 178 items was reduced and the 28% GST slab was pruned. The one rate cut which got the most attention was the one on restaurants. The GST Council had announced that restaurants would now charge GST at 5% instead of 12% or 18%. Although the changes were announced on 10th November, they were to be effective from 15th November, once the notifications were out. While many sectors like FMCG and automobile sector had reduced prices explicitly ever since GST came in from 1st of July 2017, the restaurant sector had more or less kept prices the same, choosing not to pass on the benefits of GST. Come 15th November, everyone waited with baited breath to finally see restaurants fall in line, thanks to the major cut from 12%/18% to 5%. We had explained in a previous article that due to something called “input tax credit”, although the rate of GST had come down by 13%, the actual price of food may come down by 3% odd only. But on 15th November, social media users did not get to see even that small a decrease in prices. This is true, as explained in our previous article. The change in rate and allied rules, means that input tax credit is now a cost. But having said that, it would take an amazing level of coincidence for the costs to rise just enough to match the old selling prices to the exact rupee. Either that, or the costs had actually increased much more, and McDonald’s is absorbing these costs by not increasing prices. 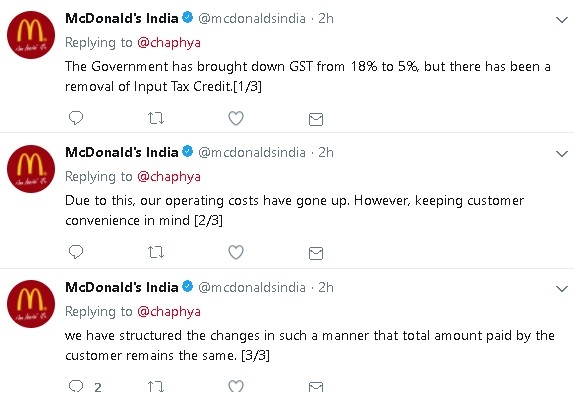 The other possibility could be that the costs have not gone up as much, but by keeping their selling price post GST constant, McDonald’s is pocketing the gains of the GST rate reduction, instead of passing it on to the customers. If this is true, then McDonald’s could be found guilty of “profiteering” in the coming month. The GST Act always had provisions to deal with such situations. The Anti-Profiteering clause, forbade businesses from gobbling up benefits accruing from GST or cut in GST rates, and asked them to instead pass on the benefits to customers. The concept is based on the principle that taxation changes should not be used by businesses to make money. Although this clause exists in the Act, there are no detailed guidelines to enforce this clause. In the initial months, it was believed that enforcing this clause may seem draconian since businesses were just getting the hang of GST. But now the honeymoon period seems to be over. According to a news report, the Government has kick-started the process of devising detailed rules to check for profiteering, and they rules are expected to be out next month. The broad idea is to prescribe a methodology to ascertain whether companies are passing on the tax reduction under GST and benefits derived from input tax credits to consumers. The Government seeks to draw inspiration and learn from similar practices adopted in Australia and Malaysia, when GST was implemented there. While it is unlikely that smaller businesses would face the heat of these rules, bigger businesses like McDonald’s etc, if found to be violating such guidelines, could be in a soup. It remains to be seen how the restaurant industry responds to the GST rate cut. They may get a grace period of a few days to re-adjust their pricing strategies, but if they continue into next month, the going may get tough.